Ernestine Shepherd began workout out at 56. Now 73, she runs 80 miles per week and can bench press 150 pounds. She was named to the Guinness Book of World Records ast the oldest female body builder. Taut abs and rippling muscles aren't exactly the stuff grandmothers are known for. But then again neither are marathons and cell phones that play the theme to "Rocky." 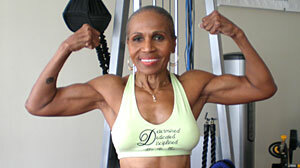 At 73, Ernestine Shepherd is in better shape than most people decades her junior. Up at 3 a.m. every morning, she spends her days running, lifting weights and working out other senior citizens at the Union Memorial United Methodist Church in Baltimore. She also works as a certified personal trainer at her gym. "I feel better than I did at 40," she said. "I am very, very happy." In less than 20 years, Shepherd has morphed from a "prissy" woman who never exercised to the Guinness Book of World Records' oldest female bodybuilder. A die-hard "Rocky" fan -- "Sylvester Stallone is my man," she cooed -- Shepherd is preparing for a body building competition this weekend. "I feel now that I am a very strong, positive and confident woman," she said. "Years ago I concerned myself about what people said concerning me. But when you get 70-something and you don't have that many years in front of you, you don't concern yourself with that." Instead, Shepherd concerns herself with her carefully formulated diet -- 1,700 calories a day, mostly comprised of boiled egg whites, chicken, vegetables and a liquid egg white drink -- and packing in the workouts needed to maintain her stunning physique. Shepherd runs about 80 miles per week and bench presses 150 pounds. Bicep curls are done with 15- and 20-pound dumbbells. Married for 53 years and grandmother to a 13-year-old, Shepherd said she is exactly where she wants to be. Well, almost. She's been looking for an excuse to meet Michelle Obama and even offered to train her. "I've been trying to get to that lady. And I can't get to her," she said. "It's so difficult." Shepherd sees her jaw-dropping transformation as fulfulling a promise to her late sister, Mildred Blackwell, who died in 1992 of a brain anuerysm just over a year into the training that she believed would drive them to become the oldest living fitness competitors in the world. "I kept up everything she said we were going to do," Shepherd said. "That's kept me so close to her." Twenty years ago, Shepherd was working as a secretary in the Baltimore school system after 30 years with AT&T. Exercising was not part of the picture. "I was too prissy to exercise," she said. "I just didn't want to have my hair messed up. Didn't want my fingernails broken." Then, at 56, Shepherd found herself in a dressing room with her sister trying on swimsuits for a pool party. "When we looked at each other we both laughed because we didn't look too good in those suits," Shepherd said. "She said 'Tina, we're going to have to do something about this.'" The allure of a swimsuit-ready body sent Shepherd and her sister to aerobics classes. And as they began to slim down, a trainer suggested lifting weights. Shepherd and her sister, who she says were "like twins," took to weight lifting immediately and quickly saw their bodies start to change. But one day, Blackwell began complaining of headaches. She was dead soon after. Shepherd said she quit exercising, holed up in her home and started suffering from panic attacks and high blood pressure. A close friend and trainer eventually forced her out of the house, telling her, "You know your sister wouldn't want you to do this." She hit the gym, this time to keep a promise to her beloved sister. In 2007, she began running. She now runs in the park for two to three hours a day and has a 5K time of 28 minutes. She has also completed eight marathons and has her sights set on the New York and Boston races, warning competitors that "the old lady's comin'." Shepherd has snagged modeling gigs and posed for Essence magazine. Even Oprah Winfrey came calling, she said, but the Sept. 11, 2001 terrorist attacks took her off the lineup. She also took first place in her class at the Tournament of Champions' bodybuilding competition in 2008. When Shepherd was named to the Guiness Book of World Records, she took Blackwell's ashes to Rome with her. "When I got to the Coliseum I cried," she said. "I stood there and I spread her ashes." She is now trained by former Mr. Universe Yohannie Shambourger. "She's special because no one can have that kind of muscle at her age," he said. "Ernestine has a body where she can compete against younger athletes and actually beat them." Standing nearly 5' 5" and weighing between 118 and 120 pounds, Shepherd is adamant that she doesn't use any performancing enhancing drugs or even supplements other than vitamin D.
"I don't want to train my ladies and give them the false impression of supplements," she said. Plus, with her 74th birthday in less than two months, Shepherd said taking care of herself is paramount. "I have old things in my body," she said.